The year was 1980 and this would be the 44th Masters, an invitational tournament which gave the Americans the chance to show off their skills and, all being well for the folks watching on TV, win on home soil. On all bar two occasions this had been the case. Only Gary Player had broken the deadlock, in 1961 and 1978. Only four Europeans were in the field – and one of those was an amateur, Peter McEvoy. Mark James was playing in his first and only Masters, while Sandy Lyle was making his debut. Finally, our own reigning Open champion was Seve Ballesteros. This would be the Spaniard’s fourth appearance in Georgia. His uncle Ramon Sota had finished sixth in 1965, which at the time was the best performance by any European. Hence Seve’s early love affair with Augusta National. Ballesteros teed off late on the first day with the wind getting up, but nothing could derail the free-flowing Spaniard. He missed just one fairway and picked up seven birdies for a 66 that gave him a share of the lead. Come Friday the swing had become a little bit lost though the trademark recovery skills were as impressive as they were in winning the Open at Lytham the previous year. The more off line he went, the less of a problem it became. Come the Sunday morning, the only excitement appeared to be whether Ballesteros could shoot 67 and earn a $50,000 bonus from Golf magazine for breaking Jack Nicklaus and Ray Floyd’s record of 17 under. By the turn he had amassed a 10-shot lead but then he did take unprompted risks. A three-putt bogey at 10 barely raised an eyebrow, likewise a birdie at 11 by his playing partner Jack Newton. Birdies at 13 and 15 and he would still tie the record. But the Masters is rarely about just tiptoeing your way round the back nine. Ballesteros found Rae’s Creek at the short 12, a hole which had seen Tom Weiskopf chip and putt for a 13 on Thursday before leaving another two balls in there for a seven on the Friday. Newton birdied and the lead was down to five. At 13 he had an iron left into the par 5, a shot which was caught heavy and which resulted in another visit to the famous strip of water while Newton two-putted for a birdie to be within three of the lead. The fight saw him play his recovery from the pine needles at 14 before order was restored at the 15th, the scene of his horror 4 iron six years later, but this time the perfect strike. Aged 23 Ballesteros became the youngest Masters champion, a record only broken by Tiger Woods in 1997. And so began a run of European magic that will likely never be repeated – we are still waiting for a winner from this continent this century. This year 25 Europeans will contest the year’s opening Major. Ballesteros won again in 1983 and Messrs Langer (2), Lyle, Faldo (3), Woosnam and Olazabal (2) followed suit as the showpiece of American golf repeatedly ended up in European hands. The folks back home, spoilt by years of Arnie, Jack and Tom had to sit through telecasts explaining where Welwyn Garden City and Oswestry were. 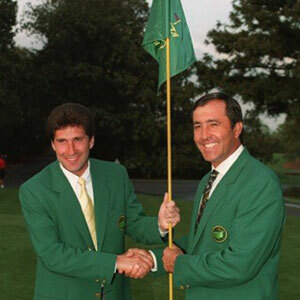 The only real surprise was that Ballesteros never added to his two Green Jackets. By 1983 he was done. As time drifts on it’s all too easy to forget the impact Seve had on this tournament. The Masters was always his birthday week and the vast chunk of Europe’s golf fans would hope he could make it one to remember. Throughout the 1980s he would arrive on Magnolia Lane as the favourite and very much the man to beat, something no other European has done since. While Seve remains the inspiration for all our Ryder Cup efforts it is at Augusta that he has most left his mark on his fellow Green Jacketeers. Phil Mickelson put together a Spanish meal for his Champions Dinner in 2011 in tribute to the player that he idolised as a youngster. Sadly the man in whose honour it was devised was too unwell to attend and, a month later, no longer with us.